"I'm selling my 2009 aprilia sr 70cc r factory.. I put more than 2k on it.. it lost compression and i don't have time to fix it.....I think that all the part that I put on it maybe i forgot a few parts.."
At least some of these listings are good for a chuckle. Aprilia SR's must be worth a fortune! We have someone on the Norfolk C-List (wish I knew how to post links) asking $3400 for a SR! This one runs, unlike this dead one Point found, but still to much money! Rare does not always equal worth. And I like the "I put X amount of money into it!". Good for them. Worse if it doesn't run! Just shows they don't know what their doing. Speaking of projects, here's another. Have not started motor and missing pedals!? Odds are its got a locked up motor. What a clown, $1500 and it dont run! You should buy that. All it needs is a carb cleaning. ET4s aren't hard to find, nor are 2004 models. This price seems a little high to me though. That Aero is a mess! Apparently, the NADA guide for Excellent condition X-90's is about $6K. However, I would never buy such a thing for that cost and can't imagine what kind of person would do so. That is a good deal. I wonder whats up with the missing front mudguard though. Kinda makes me wonder what else might be going on with this Buddy. 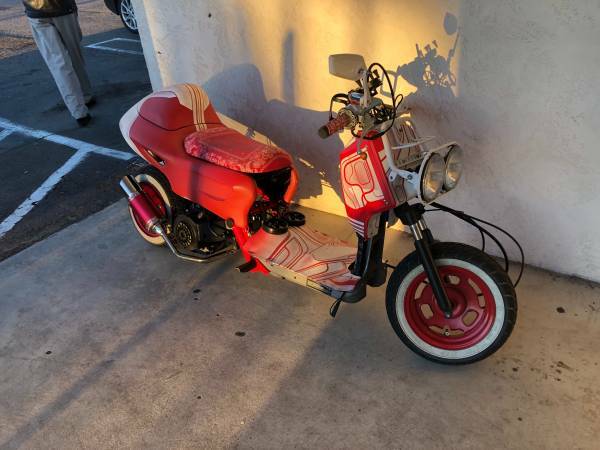 Good luck selling your Aprilia 70cc scooter Dooglas. I love the Aprilia scooters, have three of the Scarabeo 500ie's and two of the Scarabeo 150's with the Rotax engine. I used to have one of the early Aprilia DiTech 50cc scooters too and it was great also. You missed the best view.